(CNN) -- Fans of the television show "Britain's Got Talent" are looking forward to the performances of 40 semi-finalists Sunday. Susan Boyle told CNN that her new stardom hasn't changed her one bit. But one in particular will have necks craning even higher: Susan Boyle. The 47-year-old from Scotland wowed audiences and judges during her audition six weeks ago when she belted out the classic "I Dreamed a Dream" from the musical Les Miserables. Boyle will be one of a handful of singers in one of five semi-finals. Her competition includes a belly dancer, street dancers, a burlesque dancer, a dog act and a wheelbarrow dancer. Two acts from each semi-final will perform at a grand finale on May 30, according to "Britain's Got Talent" Web site. Before Boyle sang during her audition, the unassuming single woman with a loose mop of curly hair drew snickers from her audience, including notoriously hard-to-please judge Simon Cowell. The scowls and eye-rolling were replaced by wild cheers as soon as she sang the first line. Cowell raised his eyebrows in surprise. Her performance turned her into an overnight sensation, and earned Boyle a string of global television appearances, including an appearance on "Oprah" via satellite two weeks ago. The unemployed charity worker has inspired millions in the face of pop music's penchant for pre-processed princesses. The fact that she does not conform to the Hollywood stereotype has only added to her popularity. As of early Sunday, a clip of her audition had more than 59 million hits on the video-sharing site YouTube. 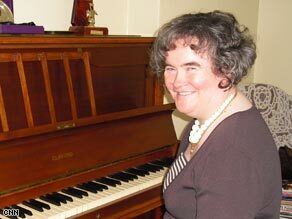 A Susan Boyle fan site with more than 17,000 members also popped up online. It features a picture of the singer clutching a microphone with a headline "Never judge a book by its cover." The site also includes song suggestions for her by fans. Recommendations include Barbra Streisand's "A Star is Born" and "At Last," a classic that has been covered by big names such as Etta James and Nat King Cole.